Western Digital has introduced a massive capacity hard drive in the market, which is ideal for people, having on-the-go digital life. This hard drive is available in the market with name Western Digital My Passport WDBMWV0020BBK Hard Drive at an affordable price. It is sleek, lightweight and compact in design and comes with 2TB of massive storage capacity. This means, you can store enormous amount of your multimedia and other data files without any mess. Also, the hard drive works superbly well with Windows 8 operating system. The Windows 8 OS makes it easy to locate digital media files stored on the hard drive, as the content is displayed in an organized manner. This Western Digital hard drive comes with SmartWare Pro automatic backup software, which allows you to save files either directly to this drive or to the cloud using your Dropbox account. 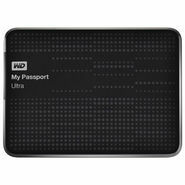 Western Digital My Passport WDBMWV0020BBK Hard Drive is compatible with latest USB 3.0 supportive devices and is backward compatible with USB 2.0 supportive devices. When connected to USB 3.0 port, it offers ultra fast data transfer rate and allows you to access and save files with blazing fast speed. This hard drive is USB powered and comes included with soft pouch that keeps it protected from scratches. Also, it is password protected, thus, keeps your data files always secured and private. As added advantage, the hard drive is resistant to shocks, thus offers high reliability.